Truly, truly, I tell you, he who believes has eternal life. I am the Bread of Life. Your fathers ate the manna in the wilderness, and they died. This is the bread which comes down out of heaven, that anyone may eat of it and not die. I am the Living Bread which came down out of heaven. If anyone eats of this bread, he will live forever; and the bread which I will give for the life of the world is my flesh. John 6:47-51 NHEB. 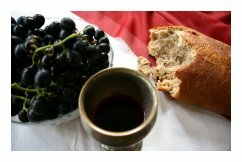 Previous Bible study lesson: Jesus' First Miracle (Water to Wine) #6.06. 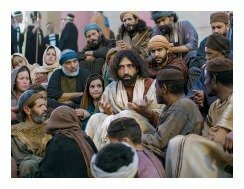 1) With what foods did Jesus feed two large crowds? 2) How many total people were fed by Jesus' miracles? 3) Why did Jesus feed thousands of people miraculously? Remember our Bible study lesson where a Samaritan woman met Jesus at the well? Jesus informed the woman that if she wanted to live forever she could drink the Living Water, which is the Holy Spirit. Today's lesson, Jesus Feeds Five Thousand, shares the color and drama that highlighted the woman at the well story. 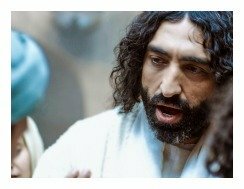 Jesus' miracle and message are quite surprising. The biblical truths are in abundant supply in this lesson. Gather your friends, grab a cool drink, and let's enjoy learning about one, or more, of Jesus' miracles. Catch the video at the end of the lesson. Please read one or more of the Gospel accounts: Matthew 14:13-21; Mark 6:30-44; Luke 9:10-17; John 6:1-15. The twelve disciples just returned from a great mission Jesus had assigned them. They were anointed and sent out to preach the good news and perform great miracles. The amazing word about Jesus was spreading like wildfire across the land of Israel (Mark 6:30). 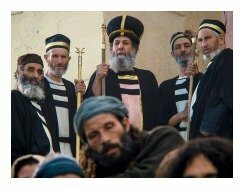 Jesus Christ, in Jerusalem immediately before a Passover celebration, finished admonishing a group of religious leaders. He enjoyed exposing religious fraud. The crowds were growing and pressing in on him, wishing to hear him speak and perform miracles. Jesus healed many sick people on this occasion because of his compassion for them. They were his sheep who had no true shepherds (Mark 6:34). Jesus was also in a state of mourning after hearing of the unjust death of his friend and forerunner, John the Baptist (Matthew 14:12-13). Herod Antipas killed John at the request of his step-daughter and wife. This was one of the saddest times in Jesus' earthly life. He and the disciples sought time to be alone, because Jesus wanted to hear more about the disciples' mission trip. 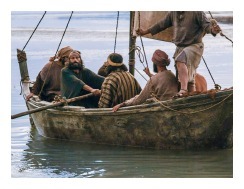 They soon headed north and boarded their boat to travel across the Sea of Galilee (Mark 6:31-32). They landed near Bethsaida (Luke 9:10) and settled into a very remote area; however, the large crowd had followed them on foot along the shore. The thousands of people actually beat them to Jesus' destination! Jesus and his disciples decided to dock anyway, because they were getting hungry (Mark 6:31). Jesus warmly greeted them despite his weariness (Luke 9:11). This period was the time of Jesus' greatest popularity amongst the Jews. Jesus had everyone talking about him and his signs, great works, and wonders (Mark 6:14). God's plan of redemption was in full swing. Jesus spent most of the day teaching the people from his seat on a hillside (John 6:3). He was teaching the masses about the Kingdom of God by the wonderful method of parables (Mark 4:33-34). The people were amazed at Jesus' teaching and his healing of the sick amongst them. These things all proved that Jesus came from his Father in heaven with great power and full authority to save souls (John 5:36). There was so much joy sweeping through the crowd, so much celebration, and so much hope. The people's long-awaited Messiah had finally arrived. The real Jews, who live by faith in their Messiah, were ecstatic. They praised the Lord. God expects you to join in this celebration on the Bethsaida hillside. Are you there yet in your imagination? Has God's Spirit brought your soul to this remarkable event? The busy day quickly passed. If you've ever done work in ministry you feel for Jesus and his disciples at this point. Teaching alone wears out a person's spirit, and don't forget his healing miracles. Jesus was exhausted! Tired, hungry, and with no recourse, the disciples approached Jesus with great concern about the needs of the crowd. They reminded him of the late hour and the fact that people required daylight to purchase food and find shelter for the evening. Jesus already knew God's plan for this group (John 5:19-20); but, as usual he wanted to test his disciple's faith. He asked Philip, "Where can we buy bread to feed all these people?" 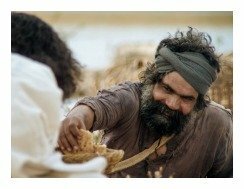 Philip disappointed Jesus with his thoughtless reply, "Even if we worked for months, we wouldn't have enough money to buy the bread to feed them!" (John 6:5-7). Another disciple chimed in, "There is nothing to eat in this remote place!" Jesus, calmly working the moment to full teaching benefit, seriously challenged them, "You feed them." The disciples looked around at each other, dumbstruck. One of them inquired, "With what?!" (Mark 6:37). Jesus asked them all, "How much bread do we have? Go, and find out." (Mark 6:38). They searched and searched. Walking through the crowd, asking for food, they looked, they hunted, but walked back disappointed in what they found. Jesus sat silently, waiting for someone to speak. Finally, Andrew shared the meager results of their scavenger hunt, "There's a young boy here with five barley loaves and two fish. But what good is that with this huge crowd?" (John 6:8-9). Another disciple added, "Are you expecting us to go and buy enough food for this whole crowd?" (Luke 9:13). Motioning to the loaves and fishes, Jesus finally spoke, "Bring them here" (Matthew 14:18). Jesus then instructed his disciples, "Tell them all to sit down in groups of about fifty people each" (Luke 9:14). The disciples spread the word; and the people sat down on the grassy hillside in groups of 50 to 100. The disciples counted the crowd at 5,000 men, plus their families (Mark 6:44). Realistically, there were probably around 15,000 people in attendance. After things settled down, a hush fell over the crowd, and all eyes were directed towards Jesus. Jesus took the loaves and fishes in his hands, looked up to heaven, and blessed the food. Jesus took the loaves and began breaking them. He handed them to the disciples to disperse. They continued until every person had all the bread they wanted. Jesus then took the fishes and divided them, so every person in attendance could receive their fill. Every soul in attendance was satisfied. Possibly as many as 15,000 people were fed with 5 loaves and 2 fishes! Jesus fed 5,000 men, and many women and children, too. The work wasn't quite complete for the disciples. Jesus gave them one last instruction, "Now gather the leftovers, so that nothing is wasted" (John 6:12). Jesus' disciples spread out and gathered all of the leftover bread and fish they could find. Soon, they accumulated twelve baskets of leftover food (Mark 6:43). So, not only were nearly 15,000 people fed, but there were leftovers! Maybe Jesus and his disciples gave some of the leftovers to some nearby Gentiles! (Mark 7:27-29). Quite possibly, the leftovers were saved for their morning breakfast. The thousands of people listened to Jesus' wise teaching. They watched Jesus heal many people. Now, multitudes of people were directly addressed by Jesus Christ's miracle. Jesus feeds 5000+ people with five loaves and two fishes! Amazing. This was one of Jesus' greatest miracles. The people were in awe. They shouted, "Surely, he is the Prophet we've been expecting!" With renewed strength from their meal, they became aggressive and tried forcing Jesus to be their king. The Jews always clamored for such a man to lead them, but they missed the point, which frustrated Jesus. Many sought an earthly king, not a heavenly Messiah. Jesus noticed the momentum building to make him king, so he sneaked away into the dark hills alone. No one knew where he went (John 6:14-15). Jesus often did this to rest and commune with his Father. Would things now calm down? Did Jesus only have one big miracle in his arsenal? Let's find out. (Please read Matthew 15:32-39 and Mark 8:1-10). Immediately after the Jesus feeding 5,000 miracle event, he performed another great miracle, which happened on the Sea of Galilee. Jesus frightened his disciples late the same evening. The disciples were resting in their boat, still trying to grasp the true significance of Jesus feeding the 5,000. They knew Jesus was ALWAYS teaching them, and they knew there was more behind this great miracle. Mark tells us that their hearts were too hardened, too blinded, to understand the truth(s) Jesus was teaching them. Watching 5 loaves and 2 fishes feed nearly 15,000 people before their very eyes was simply too much to fathom (Mark 6:52). That's what makes miracles miracles! Now, the story grows. As the disciples were discussing the event, a spooky creature approached their boat. Something was walking on water! They were terrified! They were screaming, thinking it was a ghost (Mark 6:49-50). But wait, the figure spoke. It was Jesus! Jesus was walking on water! He said, "Don't be afraid. Take courage! I am here!" Jesus walked on water to teach them another lesson, a lesson about faith! They need to believe their eyes when they see Jesus performing miracles. Jesus then healed all kinds of sicknesses and diseases in the area of Gennesaret. 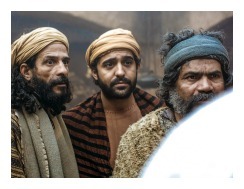 Two gospel books share the similar account of Jesus feeding 4,000 men, or roughly 12,000 people. 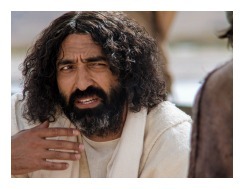 Jesus healed a deaf man in Decapolis, and the event brought a large crowd out to see him. Jesus taught the people for 3 days and noticed they were becoming hungry. Jesus told his disciples, "I feel sorry for these people. for they have nothing left to eat. If I send them home hungry, they'll faint along the way." He asked the disciples, "How much bread to you have?" They found seven loaves and two small fishes. As before, Jesus looked into heaven, communed with his Father, and received a blessing on the food. He divided the bread loaves and fishes, relying on the disciples to serve the entire crowd, which was estimated at about 12,000 people. Everyone ate until they were full and strengthened. Once again, Jesus told the disciples to gather the leftovers into baskets, which they did. They collected seven full baskets of leftovers. Jesus' entourage then departed to Dalmanutha (Mark 8:8-10). Shortly after, in Capernaum, an exasperated Jesus told the crowds that they only followed him because he fed them by means of a miracle (John 6:25-26). The people desired to work miracles like Jesus was performing, but, Jesus had to impress on them the simplest of messages, the gospel, "This is the only work God wants from you: Believe in the One he has sent" (John 6:29). Then some Pharisees and politicians encircled Jesus, demanding, "Show us a miraculous sign if you want us to believe in you. What can you do?" The religious hypocrites kept badgering Jesus, "After all, our ancestors ate manna while they journeyed through the wilderness! The Scriptures say, 'Moses gave them bread from heaven to eat" (John 6:30-31). Jesus was incensed, "I tell you the truth, Moses didn't give you bread from heaven. My Father did." Jesus always knew the source of all good and great things - his Father in heaven. Jesus added, "And now he offers you the true bread from heaven. The true bread of God is the One who comes down from heaven and gives life to the world" (John 6:32-33). The Jewish leaders were testing Jesus, ready to find error in him, to prove that he wasn't authorized by God (Mark 8:11). The darkened, unbelieving hearts of the people saddened Jesus, "Why do these people keep demanding a miraculous sign? I tell you the truth, I will not give this generation any such sign" (Mark 8:12-13). Through this amazing miracle, where Jesus feeds 5,000, and then another where Jesus feeds 4,000, God the Father anointed Jesus as the authority over salvation (John 5:26-27). These two miracles authenticate Jesus' position as the sole Savior of all mankind. There was not, is not, and never will be another Savior (John 14:6). There is no other name under the heavens by which a person can be saved (Acts 4:12). God's miracle in the desert, where he miraculously feeds the Hebrews in exile with manna, was a preview, or type, of the coming Messiah (Hebrews 10:1). God operates this way. He previews coming events with signs pointing towards those events. Jesus' miracle on the hillside, feeding the crowds with bread and fishes, was a sign pointing to himself, the Bread of Life. The bread symbolized Jesus. People who eat this spiritual Bread live eternally. Jesus continued to elaborate on the meaning of the food miracles, but this time he shared with his disciples. Jesus' disciples were arguing amongst themselves about who failed to bring some food to eat. Suddenly, Jesus had enough of their shallow bickering, "Watch out! Beware of the yeast of the Pharisees and of Herod." Jesus grabbed their attention! They stopped whining about their momentary need of food. Jesus asked, "Why are you arguing about having no bread?!" Are your hearts too hard to understand? Can't you see what I'm doing?! Can't you hear what I'm saying?! Have you already forgotten that I fed 5,000 with five loaves of bread, and had leftovers?! I also fed 4,000 with seven loaves, and how many baskets of leftovers did you pick up?!" The humiliated disciples sheepishly responded, "Seven." Jesus, shaking his head in disbelief, rhetorically asked, "Don't you understand YET?" Revisiting Jesus' statement, "Watch out! Beware of the yeast of the Pharisees and of Herod," gives us tremendous insight into the meaning of the manna and bread miracles. Jesus was telling his disciples, and me and you by association, who and what we are to trust for eternal life. It's a remarkable statement. Let's discuss the meaning in clear detail. Religion wants people to trust in their particular organization. Jesus represented organized religion by the statement, "the yeast of the Pharisees." The bread of religion is made with the yeast of hypocrites. This bread will not allow you to live eternally. Government wants people to trust in their provision and protection. Jesus represented government by the statement, "the yeast of Herod." The bread of government is made with the yeast of corrupt politicians. This bread will not allow you to live eternally. This is a message about material food verses spiritual food: mammon verses manna. Material food keeps you alive momentarily. It fills your stomach, but then passes through your system. Spiritual food keeps you alive forever. Which do you seek to fill your real purpose in life? Do you see past this short, but important life; or, can you only see to your next meal? Let's continue to spiritually reason through the message behind this incredible miracle. The source of both the manna, and the loaves and fishes, is found in heaven. These foods, on these particular occasions, are spiritual, being signified by a miraculous display of power and authority. Thus, the two miracles use food to ultimately point to Jesus Christ, the Bread of Life. These miracles are for us, gifted by God the Father. That's right, this Bread is from the Father. It contains good yeast as an ingredient. Its ingredients are made in heaven, and its bakery is located in heaven. This bread is spiritual. Eat this to satisfy your spiritual hunger, and live forever. The manna in the desert was a type of Jesus. The loaves on the hillside announced the arrival of the One who the manna pointed towards, the Messiah. Both these heavenly breads symbolize Jesus Christ, who satisfies the soul. Now, Jesus has arrived! Jesus is the Bread of Life. Eat this bread and live forever and ever. Eat this Bread, and there will always be baskets full of leftovers (John 6:47-50). Praise God! Jesus commands us to celebrate communion with bread, for this very purpose, so that we remember from where he came (i.e. heaven) and who we can trust (i.e. him alone) (John 6:51). The bread from religion and government is bad. These institutions use bad yeast for an ingredient in their bread. Its ingredients and bakeries are found all over the world. This bread is material. Eat this only, and you'll live a few short years, but eventually die. This bread is a type of mammon. It represents the world systems which are driven by power and money. Religions and governments feed you just enough of this type of bread in order to keep you under their power and authority. They keep you eating stale bread from their table of deception. When people eat at the tables of religion and government they remain hungry - there is never enough to please a hungry soul. Not only does this worldly bread leave you unsatisfied; but, there are never leftovers from these organizations. Organized religion leaves the hungry soul spiritually unfulfilled. National and world governments are incapable of fulfilling one's physical and spiritual hunger. They are horrible bakers - making nothing but mammon. Jesus says, "No one can serve two masters. For you will hate one and love the other; you will be devoted to one and despise the other. You cannot serve both God and mammon" (Matthew 6:24). The bread from organized religion and government is eternally useless - like eating cardboard. Eating this bread leads to the first death, judgment, and the second death, as well (Hebrews 9:27-28). Are you ready to start living for the next life? Are you ready to stop eating the bread of death, and start eating the Bread of Life? Jesus' critical messages are crystal clear: Trust religion and die. Trust government and die. Trust in God and his Word, the Bread of Life, and live forever and ever. Fruit of the Spirit Response to the Bible miracle, Jesus Feeds 5,000. Why did God feed the Hebrews manna? Why did Jesus feed 5,000? 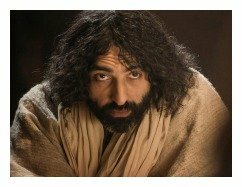 Why did Jesus feed 4,000? God fed the Hebrews, and Jesus fed 5,000, to show you that God ALONE can satisfy the spiritual hunger of anyone who seeks him and his righteousness. Dining on the Bread from heaven will lead to eternal life with the Lord. How does a person "eat" the Bread of Life? Great question, and, as always, Jesus provides the definitive answer, "As it is written in the Scriptures, 'They will all be taught by God.' Everyone who listens to the Father and learns from him comes to me... I tell you the truth, anyone who believes in me has eternal life. Yes! I am the Bread of Life!" (John 6:45-48). Do you want to live forever? Then learn from God's Word and God's word. God's Word is Jesus, and God's word is the Bible. The origins of Jesus and the Bible are found in Heaven, where God Almighty resides. Our faith comes by hearing, and hearing by the Word of God (Romans 10:17). Eating the Bread of Life builds your faith. Turn from your trust in religion and do not seek fulfillment from government services. These two things will always let you down. They're from this world and the world will soon be burned up in flames (2 Peter 3:10-13). Trusting in the world will burn you; therefore, you have to make a choice to avoid that terrible fate. Strip down everything in which you believe and trust. Walk through the narrow door that leads into the Throne Room of God. Drop to your knees at the feet of King Jesus. Repent of your selfish thoughts, words, and deeds. Stop fighting against God and give it all over to Jesus. Sinners Prayer. When God feeds people there are baskets full of leftovers - more than enough for all who love to eat heaven's Bread of Life. Eat until your heart is content, and then, share with other hungry people. Jesus LOVES a big crowd, and he loves proving that he can feed them ALL. He loves you, my Friend. Trust him to feed you. Join our next Bible study lesson: Jesus Walks On Water #6.08. 1) What is the correlating significance of these two spiritual truths? The Holy Spirit is the Living Water (John 7:39) and Jesus Christ is the Bread of Life (John 6:33). 2) The importance of leftovers was often discussed when Jesus taught about these miracles. Discuss in depth what these leftovers of bread represent. 3) Discuss ways people trust in religion, even Christian religion, to the detriment of their faith. Do the same exercise for government. 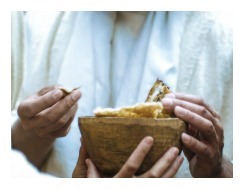 4) How does the Lord's Supper fit into the big picture of Jesus being the Bread of Live? Discuss why many disciples turned away from Jesus because of the teaching (John 6:60-66). Jesus therefore said to them, "Truly I tell you, unless you eat the flesh of the Son of Man and drink his blood, you do not have life in yourselves. He who eats my flesh and drinks my blood has eternal life, and I will raise him up at the last day. For my flesh is food indeed, and my blood is drink indeed. He who eats my flesh and drinks my blood lives in me, and I in him. As the living Father sent me, and I live because of the Father; so he who feeds on me, he will also live because of me. This is the bread which came down out of heaven — not as the fathers ate in the desert and died. He who eats this bread will live forever." John 6:53-58 NHEB. We bow before you in awe and wonder, marveling at your great power and authority. We see you work through Jesus, and through those people who call themselves by your name. Thank you for showing us your miracles. Thank you for explaining the miracles to us, so we learn more about you. Help us bring others to the holy table where the Bread of Life awaits them. Dear Lord, we lift you up and praise you. In the holy name of your Son, Jesus Christ. Amen. Share on Facebook below and click for your Free Printable Bible Study Lesson: Jesus Feeds 5000. Special Note: I'm grateful to Big Book Media & Free Bible Images, stock.xchng, Morgue Files, and Stock Photos For Free for the use of their photos for the Jesus Feeds 5,000 Bible Study Lesson.